Winter and ice cream certainly aren’t synonymous, but this ice cream, inspired by a house-made ice cream at one of Brussels’ trendiest restaurants, is perfect for a cozy winter dinner party or indulgent treat. When I created this recipe, I was surprised at how well the flavors and textures melded together; I would count this as one of my top five favorite ice creams ever – that I’ve eaten, let alone made! If you’ve been following the blog, you may have noticed a few nods to Belgium, and some of them related to chocolate, Belgium’s best-known food export. If you’ve spent any time in Belgium or The Netherlands (Holland) or on flights on U.S. or European airlines, however, you likely have seen or tasted a variation of speculoos cookies (Biscoff, anyone?). Speculoos cookies, in their Belgian incarnation, are golden-brown, crisp cookies with a hint of gingerbread flavor. Some versions have very little spice, while others add a heavier dose of cinnamon, nutmeg, cloves, and other spices. 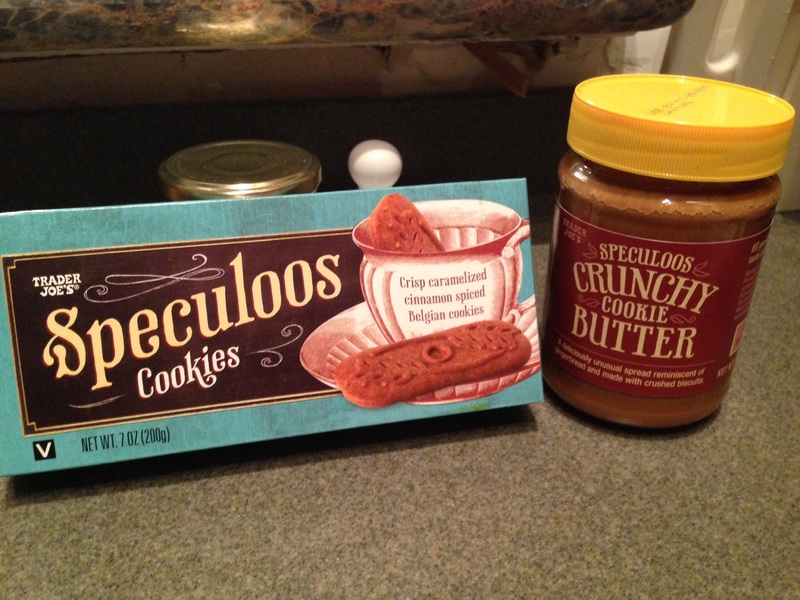 If you’re American and have visited a Trader Joe’s grocery store, you may see their speculoos cookie butter spread prominently displayed and promoted – a peanut butter or Nutella alternative. During a trip to Brussels and at the end of an excellent meal at the trendy Lola, a brasserie near the Grand Sablon downtown, I was fortunate enough to share an exquisite speculoos glace (ice cream) sundae. 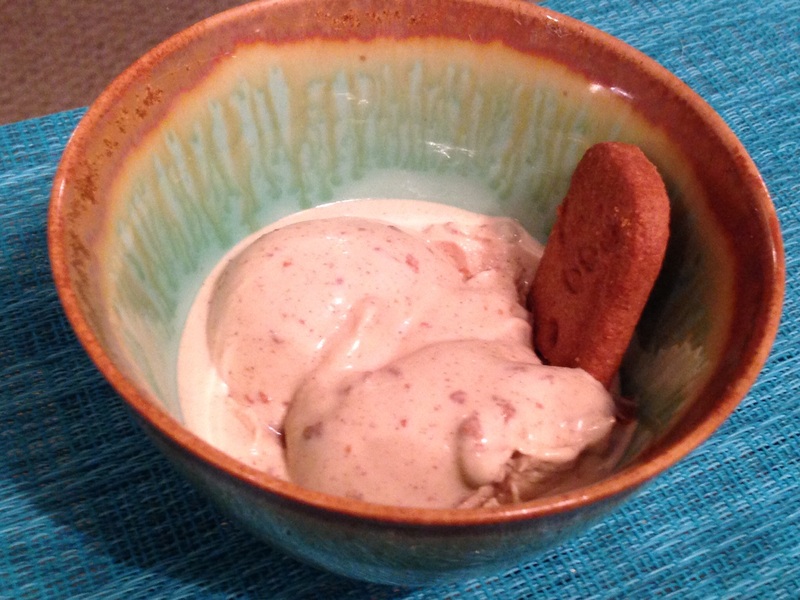 It was unmatched in its soft, creamy texture with a not-too-heavy dose of speculoos flavor. I was compelled to try a pint of another glacier’s (ice cream shop) speculoos ice cream, but the flavor was a bit heavy-handed, and the texture was not quite so creamy and rich. 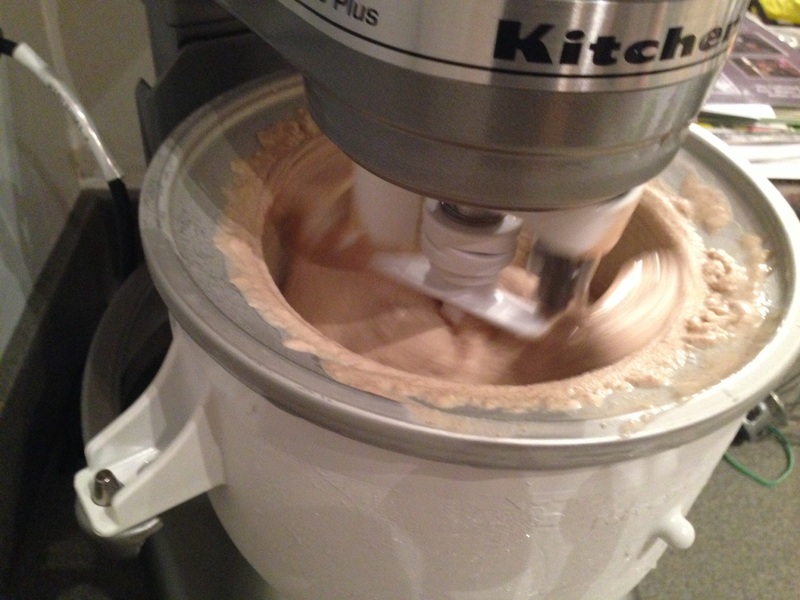 When, back home, I received a Kitchen Aid ice cream making attachment as a gift, I instantly knew what my first ice cream creation would be: speculoos. I have made several homemade ice creams throughout my life, but I’d not used the Kitchen Aid attachment, so I was skeptical. Scouring recipes across the Internet for a good ice cream base that would provide a thickness and richness – like gelato, I took this one from The Texan New Yorker and concocted my own variation. The result is a thick, creamy, and delicately flavored vanilla-cinnamon custard base with crushed speculoos cookies mixed inside and a ribbon of dense, sweet speculoos cookie butter. I won’t be crass by repeating the expletives I used when excitedly describing the ice cream (both times I made it), but I’d be happy to be served this version at the restaurant. While the custard may appear intimidating, it is quite simple to make – just leave ample time to cool the custard fully before churning. To make the custard, bring the milk and cream in a medium saucepan to a simmer over medium heat. Whisk in the brown sugar until dissolved. Remove from heat when the mixture reaches a light boil (small bubbles). Meanwhile, in a small mixing bowl, gently beat the egg yolks (can be done manually with a whisk) with the 1/4 cup granulated sugar. 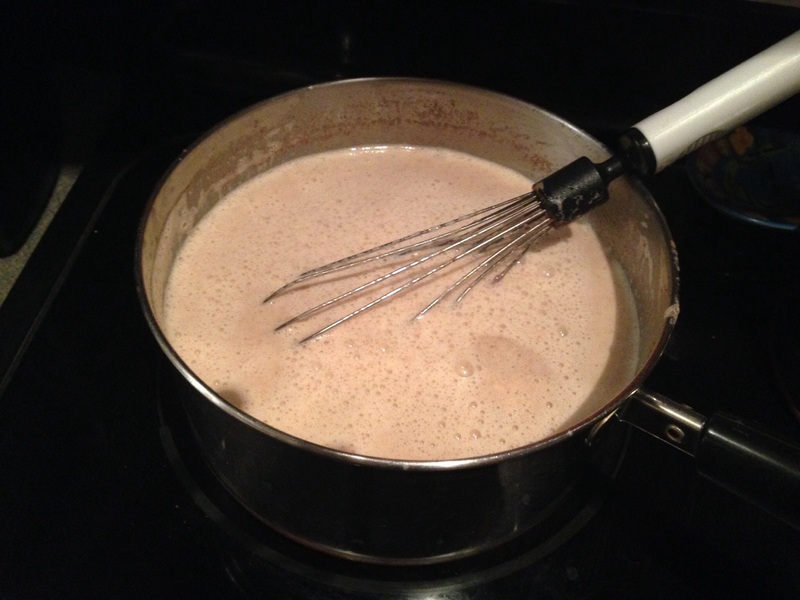 Pour 1/2 cup of the egg mixture into the milk mixture and whisk to incorporate, which tempers the mixture. Gradually whisk in the remainder of the beaten egg and sugar. Return the saucepan to medium-low heat and bring to a rolling boil, stirring frequently. When the mixture reaches a boil, remove from heat. Chill in an ice bath (fill a larger pot or mixing bowl with ice and a bit of cold water and place the saucepan with the custard mixture over top). Once cooled to room temperature, refrigerate until well chilled (or place in a freezer for about 30 minutes to speed the process. If you use the freezer for chilling, make sure to whisk occasionally to prevent a skin or ice crystals from forming prematurely). Mixing in the speculoos cookies. Follow instructions for use for your ice cream maker (I used a Kitchen Aid ice cream maker attachment to my stand mixer). While the ice cream is churning (unless doing so manually, in which case perform the next step in advance), place the speculoos cookies in a sealed plastic bag and pulverize, or, alternatively, grind in a food processor. Whether you prefer larger chunks or a fine dust is a matter of personal preference. 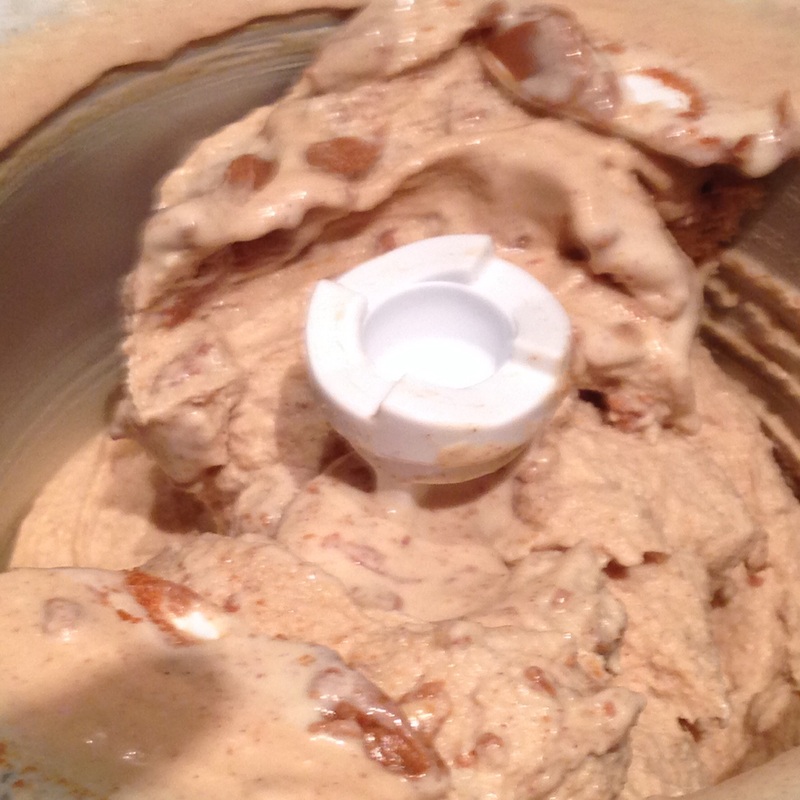 About 5 minutes before the churning is complete, gradually add the cookie butter and continue to churn/mix; repeat for the crushed speculoos cookies. Once finished, stir with a spatula to incorporate the add-ins more completely. Transfer to airtight containers and freeze overnight. This recipe yields slightly more than one quart (two pints) of ice cream and is best packed in multiple, smaller containers than one large container. The additional amount is perfect for two generous servings right out of the ice cream maker.